The original SkyShed pier is the only pier on the market which can be adjusted in tilt and 360 degree rotation after installation and tightening down the base bolts. This means you can install the pier, put your decking in place and then adjust the pier afterwards to suit your mount. This design is the easiest to install and use on the market. The unique design is the brainchild of Wayne Parker of SkyShed, the worlds most prolific observatory manufacturer, and is often purchased with the SkyShed POD or roll-off observatories. 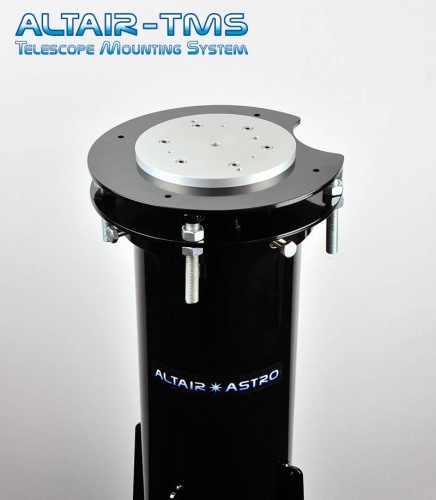 The product is manufactured in the UK by Altair Astro with SkyShed's permission, with a combination of structural and ergonomic features, which distinguish this product from other telescope piers for customers who expect the best. The piers components are laser cut from steel plate, then the base plate and anti-flex fins are welded to the 8" diameter steel column on a jig for perfect alignment. This results in a pier which is as light as possible for ease of installation, while remaining extremely rigid. The piers are then sand blasted to prepare the surface, then flame-sprayed with zinc. This is a better process than galvanizing, and is often used for industrial and military marine applications where a professional finish is required. Once the flame spraying process is complete, the piers are placed in an industrial oven and powder coated. This creates an extremely tough coating which not only creates a perfect finish to the product, but also protects it against knocks and wear and tear. This two layer coating technology is far superior to painting processes, and provides the ultimate in durability. 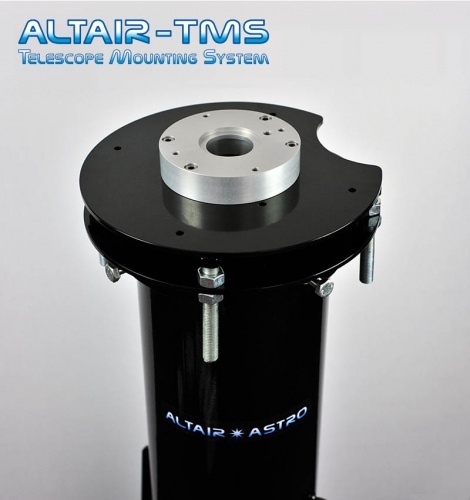 Various adapters (part of the Altair Telescope Mounting System (or TMS) are available, which allow your Altair SkyShed Pier to be used with most equatorial mounts on the market, and the pier top plate has a standard Meade LX series 6-hole pattern, enabling direct attachment of Meade wedges and some Astro Physics mounts. The pier top plate doesn't have to be changed (or even adjusted in tilt) in order to fit most mounts, adding to the modularity and convenience of the product. The price includes UK Mainland delivery. (Far North Scotland, EU or overseas customers please email us for a shipping quote). Why a pier? It's ultra-stable, and you don't have to keep re-aligning your telescope mount every time you use it. It can be quickly and conveniently moved if you move observing locations, and it's a must-have if you have an observatory, creating loads of space around the telescope - no more bumping into tripod legs in the dark, and causing wasted sub-frames during a good imaging run. Why the Altair/SkyShed Pier design? It's the easiest pier to install, period, and the special adjustable pier-head saves you set-up time. 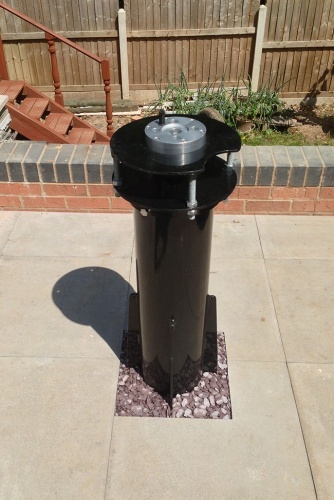 Pier levelling and rotation can be adjusted AFTER installation on the base! This is the most innovative pier on the market, and the first to sport this feature. It's for customers who appreciate a good quality finish, and a nicely made product due to laser cut steel, and a beautiful gloss "automative grade" powder coated finish. No spraypaint, no single coat of DIY-quality "rust resistant" paint finish which will chip off and corrode, and no amatuerish welding. This product is professionally built to last. What's the benefit of post-installation adjustment? The pier head can be locked in any position, at any time. That means there's no need for perfect North alignment of the base bolts, and even if you get the base levelling slightly wrong, you can still ensure your mount is perfectly upright and aligned North/South. That means you don't have to be a DIY expert to install it! You can also lower and raise the pier head by about 6" by adjusting the 4x 16mm bolts around the perimeter. What comes in the box? The pier assembly and all bolts and nuts for the pier-head are included. Yur choice of either straight or L-bolts and nuts are included for fixing the pier down. How to I fasten the pier to a new poured-concrete surface? If you're going to pour your own concrete, we suggest using a wooden template for the base and L-bolts and nuts. Simply cut a piece of wood to the same dimensions as the concrete you're pouring, and place the pier on top of the wooden template. Mark the 4x holes through the base, and drill holes for the L-Bolts. Then push the L-bolts through and fasten them to the wooden template. When you've poured the concrete, place the template on top, and allow the L-bolts to sink into the wet concrete. Remove any excess concrete and allow it to set. When you remove the template you will have the 4x bolts protruding, to which the pier can be fixed down using the nuts provided. (Click on the image gallery for step by step photos). How to I fasten the pier to a new poured-concrete surface? If you want to install the pier on an existing flat surface, choose the straight-bolt option when ordering instead of the L-bolts. Once you have drilled 4x holes in the hard surface which correspond to the pier base holes, you can fill the holes with "builders epoxy" and allow the straight studding to set before attaching the pier with the buts provided. Alternatively you can use your own expanding bolts and so-on depending on the type of surface and your preference. How do I attach my telescope? 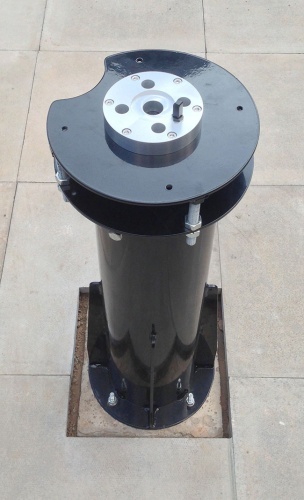 The pier is pre-drilled with 6x holes which fit our CNC machined aluminium Pier adapters for the iOptron iEQ45, Celestron CG5, Skywatcher EQ5, HEQ5, EQ6 German equatorial mounts (see the related products below). Installing a mount and adapter takes a few minutes - all the stainless steel bolts and nuts are provided to attach it. 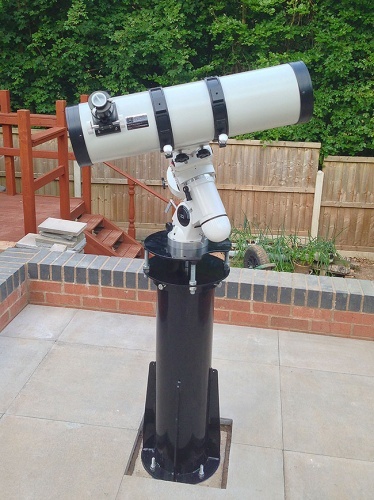 You can also easily drill the 13" diameter top plate with a normal drill with metal drill bit to accommodate your Meade or Celestron Wedge or a Losmandy Pier adapter - in fact any mount can be easily adapted to fit. Finally, you can bolt certain mounts directly to the top plate without an adapter or the need to drill holes - such as some Meade LX200 fork mounts and Astro Physics mounts with a 6 hole pattern. Can be adjusted in levelling and rotation AFTER installation saving time and effort. 8 inches in diameter adjustable in height from 36-38 inches (optimum size range for small or large SCT's, or long refractors on an EQ mount). All steel construction throughout for extreme rigidity, yet relatively light weight. Powder coated laser-cut steel for a crisp finish. (Another first). Flame sprayed zinc undercoat for a better finish than galvanised, and marine spec durability. Large, flat 13" Dia baseplate, for easy access to the base bolts, with four perimeter fins. 4x massive 16mm bolts support the top pier plate. Pre-drilled for classic Meade and Celestron Fork mounts. Adapters available for most mounts (see compatibility list below). (Search for "pier adapter EQ6" for example). Suitable for up to 16" Cassegrains and heavy duty mounts. (Call for larger custom sizes). Hole in base and cap for neater hidden power cables. Perfect for any observatory, including the Skyshed POD. Can be filled with sand (in bags) to dampen vibration even further. We provide "L-bolts" if you're pouring concrete, or "straight" bolts, enabling you to drill holes in an existing surface - such as a concrete pad. Just let us know which you prefer. Can be shortened easily if needed - just cut the top off the tube with a bandsaw or plasma cutter. Your local metal shop or even garage can do it in minutes. Alternatively, place a special order with us. L-Bolts or straight bolts included. Your choice. Usually in stock in standard length. A crisp, tough high quality powdercoated finish, with neat welds, which will last many, many years. The SkyShed/Altair pier is the worlds and the UK's best selling pier design, ever. Over 12 years in production, much imitated, never equalled. (The pier adapters connect to the pier top plate using 4x M8 cap-head screws, fastened by nuts underneath). * For visual observing with the 8" Adjustable Steel Pier, it is possible to fit the EQ8 and Paramount MX Directly to the pier top and secure the bolts with nuts on the underside, however the machined aluminium PAD-EQ8 and PAD-PMX Pier adapters provide a much smoother surface for easier polar alignment.